He touched her shoulder, then gripped her hand in sorrow. Before he got up he looked at her eyes to say goodbye. “I am Abu-Mahmoud… your neighbor.” (With a voice quivering with fear). He patted his shoulder compassionately. At once she patted Abu-Mahmoud’s shoulder reassuringly, with the pretended smile on her lips he loved. But her smile was coloured by sorrow. He recognized that a combination of humanity, sacrifice and altruism permeated her romantic spirit, as well as the fragrance of Damascus jasmine. 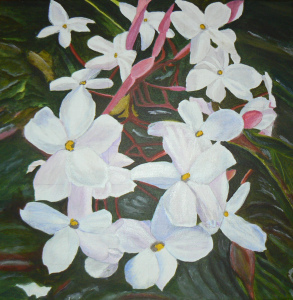 Is it possible for the scent of a jasmine flower to be that skimpy? For people to be overlapped with smell of death,and the folds of their thoughts coloured with dark red?